Zebra has announced the release of their new 3600 Ultra-Rugged series of scanners. They are purpose-built to exceed industry standards for durability, scan performance and manageability in demanding industrial environments such as warehouses, distribution centers, manufacturing shop floors and do-it-yourself (DIY) retail stores. 1D and 2D versions of the 3600 series are available with corded and cordless options for fast, accurate performance in picking, packing, shipping, receiving, work in progress (WIP), inventory tracking, track and trace, cross docking and point of sale (POS) applications. Built to perform in extreme conditions, the ultra-rugged scanner series offers the industry’s highest drop, tumble and sealing specifications in its class and is the industry’s first IP67-rated scanner capable of enduring complete water immersion for up to 30 minutes. Code has announced the release of the Code Reader 6000 (CR6000), an industrial grade direct part mark (DPM) reader that enhances data collection with the latest advancements in barcode reading. The CR6000 employs Code’s latest imaging technology to achieve consistent first pass read rates of dot peen and laser-etched barcodes, regardless of surface type. Combining advanced illumination control and patented anti-glare technology with a propriety decoding platform, the CR6000 excels in reading low-contrast, hard-to-read barcodes, even those that are damaged by every day wear and tear. 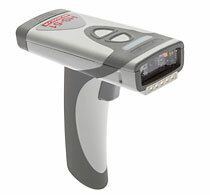 Code has announced the availability of the Code Reader 3600 Direct Part Mark (CR3600 DPM). 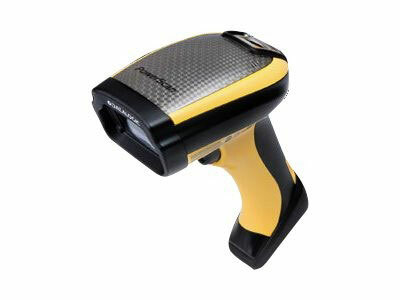 This new addition to Code’s product line provides an option for the CR3600 to read DPM barcodes. 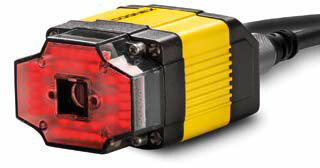 With an IP54 rating, the CR3600 DPM is rugged and durable for the most demanding of environments. Available in portable wireless palm and handled configurations, the CR3600 DPM reliably transmits barcoded data to a host device via a secure Bluetooth connection. With the capability of direct data input from its keypad the CR3600 DPM provides instant visibility of stored data on its brightly colored screen, making the CR3600 DPM the ideal mobile barcode reading solution for deployment where integration and versatility are required. Cognex announced its DataMan 5.2 software release with expanded tuning and scripting capability as well as a new test mode for its popular DataMan 300 and 503 series of barcode readers. The new software significantly increases read rates by decoding lower resolution 1-D codes and extending intelligent tuning capabilities to all symbologies, including Aztec, MaxiCode and PDF417. The software release includes the high-performance Hotbars algorithm, which handles both 1-D and PDF417 barcodes. Intermec has released a software update providing Direct Part Marking (DPM) capability is now available for 70 Series and CK3X mobile computers that are configured with the EA30 scan engine and V1.50 system software. DPM puts a lifetime identification mark permanently into an item. 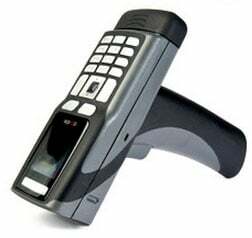 The ID is typically a serial number or other information that uniquely identifies that item, paving the way for total lifecycle traceability. DPM with a Data Matrix or other barcode symbology makes it practical to identify almost anything, including small, hard-to-label items. DPM also makes it practical to instantly access essential information about the item throughout its life cycle and throughout the supply chain— even in challenging environments where traditional barcode systems won’t work. 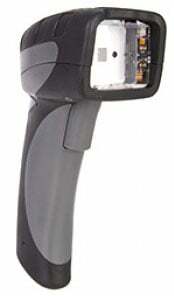 Microscan has announced two new wireless handheld imager additions to their extensive product offering. The HS-51 and HS-51X handhelds are ideal portable reading solutions for almost any 1D/2D symbol, with a compact and durable design to withstand multiple drops from 6 feet. They combine advanced decode algorithms and dual field optics with user-friendly features and the convenience of Bluetooth wireless connectivity. The HS-51 and HS-51X imagers are equipped with a 1.2 Megapixel CMOS sensor and dual field optics to provide reliable reading of codes ranging from large 1D barcodes to tiny high density 2D symbols. The HS-51 is an excellent portable solution for decoding 1D/2D symbols in common applications such as high-contrast, black and white labels. The HS-51X additionally includes Microscan’s industry-leading X-Mode decode algorithms and innovative bright field lighting for reading difficult, low-contrast codes, including direct part marks (DPM) such as dot peen and laser/chemical etch.